The Nautilus X from Aspire, the Long awaited upgrade of the legendary original Nautilus and lets face facts here many have tried to rival or beat the success of the Nautilus and have not even come close as regards a mouth to lung Tank. This tank represents innovation like no other and we very much doubt that you will be disappointed, it has been superbly designed to provide you with a premium vaping experience and achieves this goal in a number of ways. 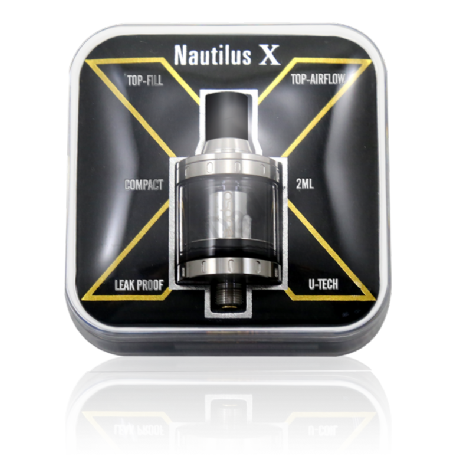 The Nautilus X features the unique new U-Tech coil technology which offers an all new airflow performance. The Nautilus X is available in 3 colours and also a limited edition rainbow effect. The Nautilus X represents the peak of the Aspire atomizer development curve. Specially designed to provide a premium vaping experience with increased flavor and unique U-Tech coil technology. With all new airflow performance, this is the future of micro tanks. Poised to transform how vapers experience flavor and hassle free day-to-day usability. The Nautilus X, born from the creative minds of the original global vaping pioneers.